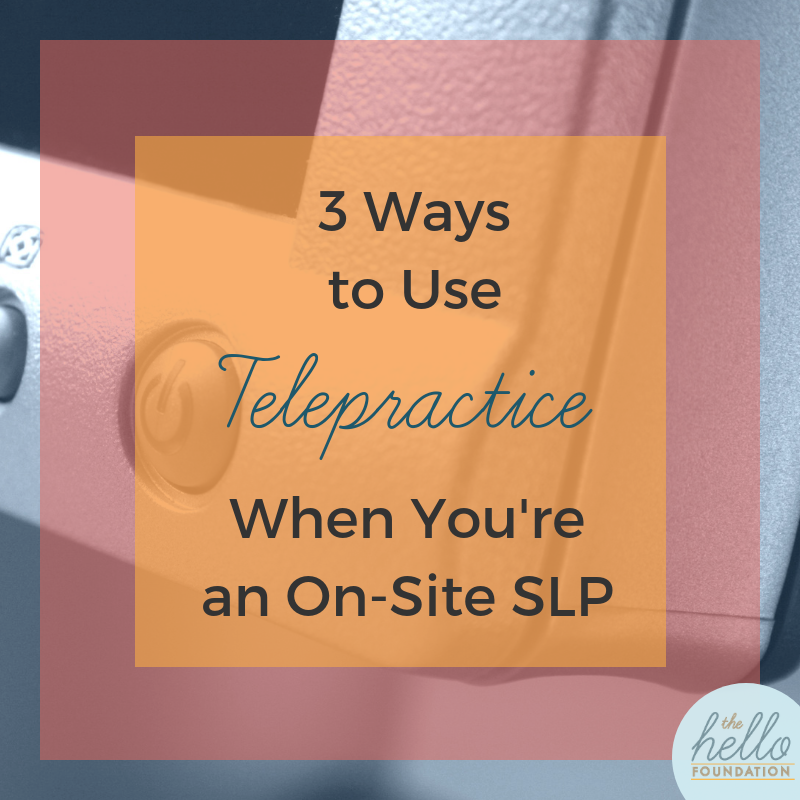 When SLPs think about telepractice, often we think of the model that is being pushed by larger national telepractice companies: An SLP in one state provides direct services online to kids at school in other areas. However, this is a limiting way to think about telepractice. When we think of telepractice as one of our many tools in our clinical toolbox, we can enhance and improve our services to kids. We can be local SLPs, based in school buildings, and incorporate telepractice into our work to better meet the diverse needs of the kids, families, and staff that we serve. A live video meeting is a great way to share information between all of the important people in a child’s life. Invite any stakeholders that might have interest and input into what you’re discussing at the meeting. This could be a family member who is not able to attend, or an outside provider or specialist. I worked with a family for a number of years. After a few no-shows for meetings, I got in the habit of picking mom up at their hotel and driving her to school for meetings. I think we could have easily added streaming video from her phone so that she could attend meetings. We all know that if you work in schools, you get to be a pretty good generalist. However, there are times when you really want to consult with another SLP who knows a lot more about cleft palates than you do. Streaming them into a session gives you an opportunity to receive guidance about your treatment and leads to better outcomes for your student. There are also opportunities for collaboration with the private SLP who is also seeing your student, for a feeding specialist during mealtimes, for an AAC specialist during circle time . . . the possibilities are endless. Ever work with an unmotivated 5th grader working on /r/? Why not make it more interesting and have them work with a video penpal at another school? Or have students interview someone from the community, such as a firefighter or the mayor? Telepractice also offers the opportunity for virtual field trips. This is an especially fun option for students who live in rural areas. For more info on how these can be done, read our article about them in the ASHA Leader and/or listen to my podcast episode about them. Finally, don’t forget about the possibilities afforded by recorded, asynchronous video to breathe new life into an old lesson. Working on describing? Why not record videos of the principal, office manager, and the custodian describing their dogs. Show your kids during their sessions and then have them write their own descriptions for a video to be shared back to the principal. Likewise, students can record short vlogs at the end of each session to share with their caregivers. “Hey mom, today in speech I worked on keeping my teeth closed for the /s/ sound. This is what it’s supposed to sound and look like.” This is a fantastic way to increase the home-school connection and accelerate carryover. Videoconferencing has changed our world in so many ways. I encourage you to bring a little bit of that change into your therapy room someday soon!